This couple’s colorful wedding with garba dandiya and stunning decor painted the desertscape of the Rajasthan in vibrant hues. 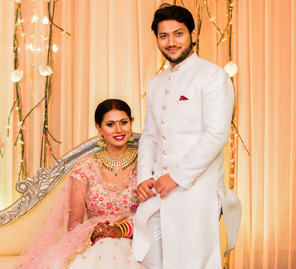 Rashi and Mudit’s wedding was a lavish affair that impressed all with its charming events that took place in beautifully decorated spaces. To capture their boisterous revelries and candid emotions, the duo had WeddingSutra Favorite - Happyframes by their side. Rashi and Mudit met in high school when they were teenagers. 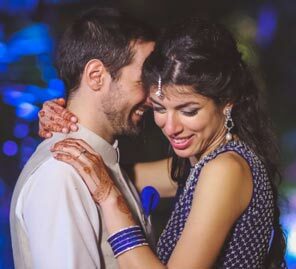 Their friendship eventually evolved into a romantic relationship, and after ten years of knowing each other, the two decided to take the plunge and tie the knot. 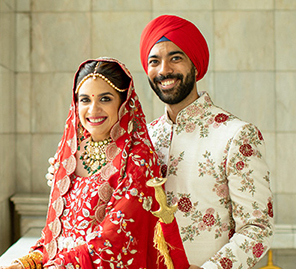 The couple hosted their wedding celebrations in the faraway setting of Lal Bagh, Rajasthan, where they created an elaborate set that served as a splendid canvas for their grand celebrations. 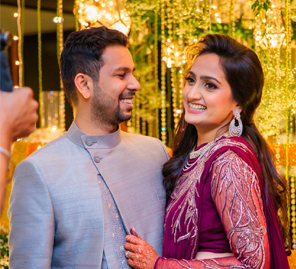 After meticulously planning every aspect of their wedding, Rashi and Mudit wanted a photography team that would do justice to all the moments they anticipated and prepared for. They picked Happyframes as they had seen the company's work which had left them impressed. The wedding photos shot by Happyframes captures the depth and breadth of the emotions, excitement and energy at all the functions. A night of dancing marked the beginning of the couple’s wedding festivities. Marigold blooms, umbrellas, and colorful drapes were used to decorate the venue, and purple lights further enhanced the ambiance at the setup. A large circular structure decorated with lush foliage stood in the center of the venue, and pretty canopies dotted the area. Rashi picked a blue and white lehenga for this fun night, and Mudit complemented in a kurta and bandi jacket in the same colors. The mehndi function featured yellow, pink, orange and green colors in the decor. Interesting decor accents such as windmills, Rajasthani puppets, elephant cutouts, and tassel chandeliers welcomed the guests at the entrance. A circular canopy draped in marigold blooms was erected in the center of the venue for the bride to sit under and get her henna applied. Rashi and Mudit’s evening sangeet was all about striking decor and power-packed performances. At one end of the venue, there was a large stage with an LED backdrop with an ornate frame. The regal touches included throne-like seating for the couple and exquisite floral elements. Rashi wore a blue and yellow lehenga for this event, and Mudit opted for a white and blue kurta and a bandi jacket. Red and white flowers were used in abundance to set the stage for Rashi and Mudit’s wedding. An entryway decorated with fresh blooms lead the guests to a venue that looked like it was decorated for a royal wedding. The couple entered together in a cart covered with white flowers and included white peacocks. Rashi and Mudit exchanged garlands on the imposing stage that incorporated elements of imposing Victorian architecture. Live singers entertained the guests at this event which was enjoyed by all.